You want to sort the display of circulation policies in your staff client. Click Administration → Local Administration → Circulation Policies. Right click on any column header. 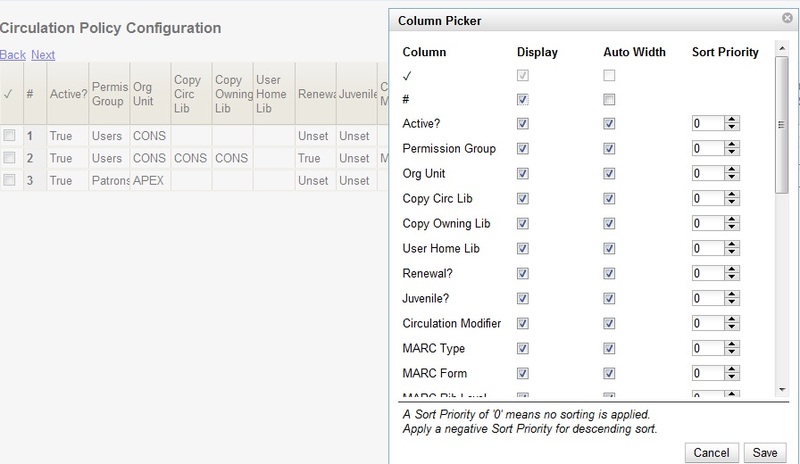 Check the Display box if you want to display a column in the staff client. Check the Auto Width box if you want the width of the columns to adjust to fit the staff client. A sort priority of "0" indicates that no sorting has been applied. Columns will display in their default order. A sort priority of "1" indicates that ascending sorting should be applied to this column first. Subsequent sorts will be applied as you continue to enter increasing numbers. A sort priority of "-1" indicates that descending sorting should be applied to this column. Click Save. The circulation policies will now sort according to your selections each time that you log into the staff client.